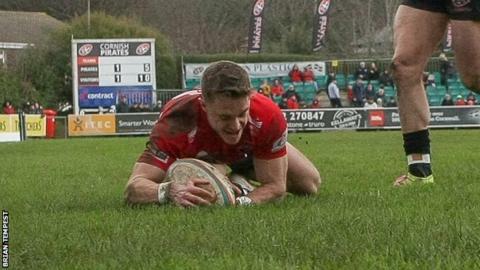 Cornish Pirates have agreed new contracts with back-row Matt Bolwell and winger Alex O'Meara. Former England Under-18s forward Bolwell, 23, made his Pirates debut in 2013 and has signed a two-year deal at the Championship club. O'Meara, 25, who previously played for Ireland Under-20s and England students and has agreed a one-year contract. The pacy wide man has scored 35 tries in 71 appearances for the Pirates since his debut in October 2015. "Injuries frustratingly held back Matt's initial development. However, he has really come of age and is a rugby warrior who really puts his body on the line. As we have seen this season, he is a magnificent competitor," joint head coach Alan Paver said. "Alex is another player whose development has been great to witness. He has bags of pace and now with added extra attributes, including his defence and communication skills, as a wing he is up there with the best in the Championship."